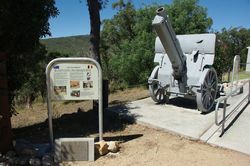 The Leggett Memorial commemorates Australian soldiers who served in the defence of Belgium during World War One and is dedicated in memory of Corporal Leggett , a Goulburn soldier believed to have been the first soldier killed in action in the defence of Ypres in Belgium during World War One. 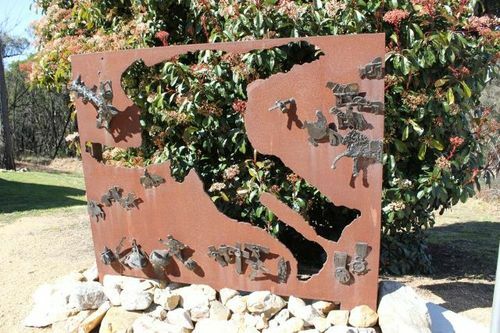 The memorial is a two piece bronze and steel sculpture created by Belgian artist Henk Delabie, incorporating a series of bronze objects produced by Belgian children. 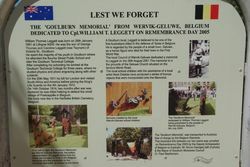 The first version of the sculpture sits in the grounds of the Geluwe church on the Menin Road. The work depicts how they view Leggett's and Australia's role in the town's history. during the First World War. by the people of Wervik-Geluwe, Belgium.